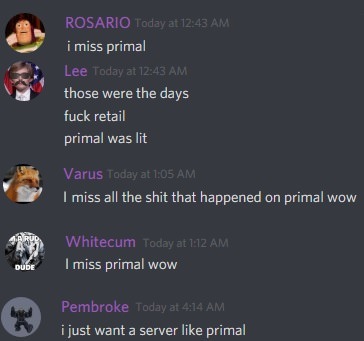 -The private server community at large likes new things Yes, as toxic as the FRESH style is, this idea has been done before and the majority of players that were interested in it have played through primal vanilla and im not convinced a large amount of players are willing to do it again. 1a. Is the coding the same from expansion to expansion? At least in regards to Vanilla through Wrath? 1b. Do they have enough coders to handle running 3 servers? 1c. Do they have enough game masters to monitor 3 servers? 2. Are there enough players currently to make it a viable idea? You may have 25 people that want a vanilla server but if they are looking to do 40 man raids. Even if they allowed cross faction raiding, it's not going to happen because there aren't enough people. 3a. What are the states of the current servers? Are they as close to being finished as they can be, or are they still in need of work? 3b. If they are still riddled with bugs and the staff doesn't have the manpower. Wouldn't it make more sense to get these fixed up before taxing the resource pool? Yes, I fully understand that the TrueWoW body is looking to increase their ranks possibly in the form of coders and GMs. This is something that takes time. I personally would want to have some kind of faith knowing that they are getting people on board that knows what they are doing instead of filling spots for the sake of filling spots just because they need to have more people to handle the new workload. That's all I can add to this discussion at the moment. We NEED PrimalWoW CLASSIC instead of the TBC garbage we have now xDddd. (25 men lolz!!1!!) who needs scripted mechanar when you can have b0rken naxx? No rose tinted googles btw xxxddd. Note that the last time I posted this suggestion the private server dynamic was bit different. You had two major vanilla realms about to release. You had a major content update for Primal TBC about to release as well. Those realms have released and settled down. One of them is bleeding players due to staff mismanagement. We could easily try to bring them to play in our communities. Hyjal has been released and Black Temple is polishing up nicely. PrimalWoW has a development cycle which will last until the year 2022 for content completion. TBC will be live for another year assuming BT, SWP, and ZA meet deadlines. If you are able to get BT to a healthy point, it would be the prime opportunity to release a new realm. That thread was closed and locked just after a single day. I don't think it was indicative of a community consensus nor something that should have been shut down so quickly. The last suggestion was only 3 months ago, and all of the arguments made there still hold up, it was not denied because of some 'dynamic' of other server releases. It's up to staff/dev team to pick something like this up, if it's made well then players will come but that is also the case with the two already existing realms. Moroes is a clown but he's not wrong, it's not like primal vanilla was in any way better than tbc is now in terms of quality. Also, J Allen 'Eronox' Brack is actually strongly supporting the idea of a third realm that progresses Vanilla and stays there once done. Remember when you where playing primalwow? The realm with currently tbc content on the 3.3.5 client? yeah, i remember that too. I don't want to say "You think you do, but you don't"
But, it would be a lot of work for staff to make that realm for you guys, and since the realms have moved to the downgraded host, we are already having some nasty lagspikes with 2 realms + PTR. Adding another seems like inviting disaster to me. The problem would also be the moment something isn't completely working right, or the realms start lagging each other even more, people would cause such a horrible ruckus again, just like during the instability shortly after TBC launch on Primal. You might say that it would bring some people back, but would it be enough?. No one knows, and to me it seems like a "all or nothing" kind of bet to try to make another realm run on the current host. Either it works and we grow, and can afford a better hosting machine, or it crashes and burns, causing population on all 3 realms to diminish further. While i agree it would cause some strain on the current servers as it would spread out our already limited resources, i would just like to add it wouldnt be a difficult task to get working, even with it being built on our current core. We would have to do some testing and some digging for the old fixes but other than that it shouldnt be too bad, Vanilla content is cake to code compared to wotlk or tbc. On Primal I think that is what is currently going on and I don't see any issues with it. If my understanding is correct they are running WOTLK, but are only in TBC content. Maybe there are issues with it and I'm just not seeing them since I don't tend to focus on compare and contrasts from expansion to expansion. From what I'm reading so far it doesn't seem like it would be a hassle to pull off. That at least gives me some hope for those that would like to have a vanilla experience. Which then still brings me to a point that I'm sure was brought up prior, I know for certain that it was a concern of mine. Do the staff have enough resources to make it a reality? One could easily argue, "No one knows but the staff and that should be their concern." I would only partly agree with this line of thinking. Yes, it is true that the staff knows what they have to work with. Maybe this is my ego? getting in the way. I would much rather see them focus their efforts on getting what they currently have as issue-free as possible before taking on another project that will potentially require bug fixes. Generally speaking, more people working on something can get it done faster than fewer people. Which is what would potentially happen until they could get people to come in and fill in the gaps.